Ever since opening its first branch in Tokyo’s Ikebukuro district in February 2015, Cat Cafe Mocha has become a hugely successful business for Japan’s KI Corporation, expanding quickly throughout Japan with outlets in some of the city’s most popular areas and also further abroad in locations like Osaka and Nagoya, all in its first two years. ▼ Mocha is known for its stylish interiors. 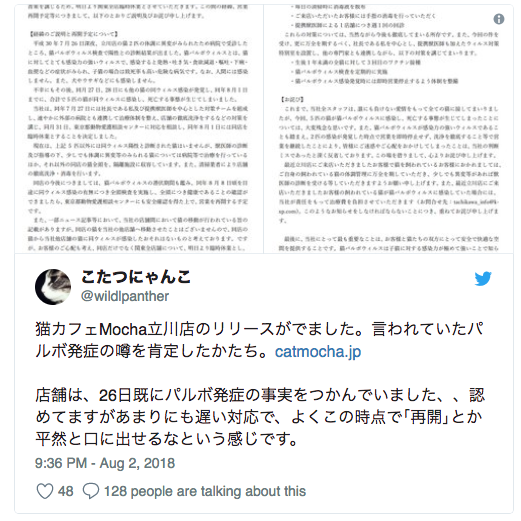 In July, Cat Cafe Mocha opened its newest branch at Tachikawa, a city in the west of the Tokyo Metropolis, but within a month of opening, the new cafe was under fire by an anonymous source connected to staff at the store, who leaked the news that a number of cats on the premises had died from a feline parvovirus infection, while management kept the business running as usual. 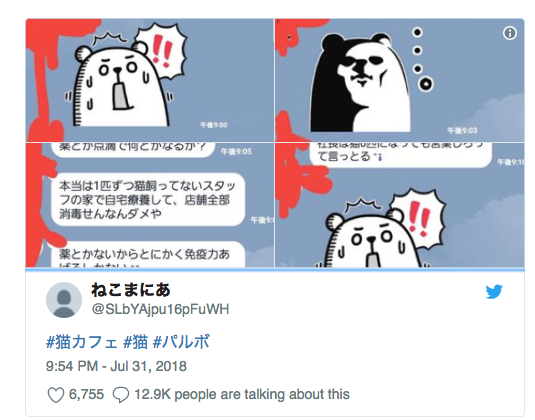 The below tweet, dated July 31, shows the original messages shared by the source on messaging app LINE, which state: “There is a 90-percent chance of kittens dying once they’re infected” and “four kittens have died in four days but the head of the company won’t close the store“. The messages then go on to say that “there are six cats left now“, “staff are crying while at work” and “the head of the company will keep the store running, even if there are no animals." According to a statement released by KI Corporation on 2 August, two cats at their Tachikawa branch were taken to a veterinary specialist late at night on July 26 after showing signs of illness. Tests revealed positive results for the feline parvovirus infection, and following this diagnosis, other cats also tested positive on the 27th and 28th, with five cats in total passing away from the illness by 1 August. The feline parvovirus is highly contagious and spread through infected feces, blood, urine, or fleas from an infected cat. The virus causes a decrease in the cat’s white blood cells, resulting in a high mortality rate, especially when found in young cats, with symptoms including fever, loss of appetite, vomiting, diarrhea, and bloody stools. The virus cannot be spread from cats to humans. ▼ Screenshots of the official statement and apology from Cat Cafe Mocha. The head of the company says that once the infections came to light they set up a special response team, putting the remaining cats into quarantine, consulting veterinary specialists, and sanitising the cafe to help stop the disease from spreading further. However, after discussions with the Tokyo Metropolitan Government’s Bureau of Social Welfare and Public Health, the company decided to enforce a temporary closure of the cat cafe, in order to ensure the disease was thoroughly eliminated through proper sanitation and checks by officials. To alleviate the concerns of customers, the company also decided to temporarily close all its branches in the Kanto region (in this case, Tokyo, Saitama and Kanagawa Prefectures) while the cats at these premises underwent tests for parvovirus infection. According to the official statement released by KI Corporation, all Cat Cafe Mocha stores had worked to keep their cats free from the feline parvovirus with a round of two vaccinations for animals between the ages of 2-4 months, followed by a vaccination every year afterwards. However, they will now give three sets of vaccinations to all cats under the age of one in order to ensure the health and wellbeing of their animals. The company has issued a formal apology over the incident, saying, “We deeply regret our mistake in judgement to continue operating and not close the store promptly for thorough sanitation after two cats were found to be infected.” From now on, they say they will close stores immediately if any cases of feline parvovirus are found. While it appears that Cat Cafe Mocha’s other Tokyo locations have now reopened, their Tachikawa branch remains closed until further notice. Once the premises are thoroughly cleaned, they will need to pass a host of checks by Tokyo’s Social Welfare and Public Health Bureau to ensure their cats, and shared equipment like bedding and feeding bowls, are virus-free. If they get the all-clear, they aim to reopen around Aug 8. The only way these places are good is if they are seen as halfway houses for street cats to be rehomed. Otherwise, this kind of suffering will happen again and again. Gratitude to the anonymous source - you did the absolute right thing. The owner need to be put up on charges, the cats were clearly not vaccinated which would have stopped the virus from spreading in the first place. Another concern that I have is that cats are the trend in Japan now, so what happens after the fad? Fads die fast in Japan. Unless these places genuinely have the welfare of animals at heart, they deserve to be closed down. Cruel and un-necessary business. These animal cafes are cruelty, the animals are heavily stressed out and should not be in that kind of environment. Especially places like owl cafes which force the animals to be in a place which is the complete opposite of their natural environment. The animals are forced to go out and "work" until they are of no use and live in horrible conditions, getting only the minimum needed to survive as the owner only cares about profits. It's essentially slavery. Absolutely disgusting businesses that would be shut down if animal welfare organizations had any teeth (the zoos would also be a prime target, just research the story of Hanako the elephant if you want to see how bad things are), and the public needs to be aware of the kind of businesses they are supporting. There actually are some good animal cafes that have very strict rules on how long the animals are out and what they are subjected to, and are usually used as a shelter where customers can also adopt them if interested. I can only hope that this story leads to some investigating reporting on the practice and more encouragement of whistleblowers at these shops, but I know better than to get my hopes up here.